AirAsia has again decided to pull its flights out of Mumbai airport—this time, barely a year after relaunch. From April 29, Indonesian AirAsia X will not operate its Mumbai-Kuala Lumpur flights, which were popular with city tourists bound for Bali. The decision has left hundreds of passengers who have already booked their summer jaunt to Bali in the lurch. Confirming the flight suspension, an AirAsia India spokesperson said that passengers who had bought tickets on Mumbai-Kuala Lumpur-Bali flights scheduled post April 29 have been given four options. First, re-route their flights through other nearby AirAsia destinations in India (at no cost, but subject to ticket availability) or retain the value of the fare in a credit account to be redeemed in six months or change the travel date to one before April 29 (again subject to availability) or obtain a refund. Mumbaikar who had booked three Mumbai-Bali return tickets on January 10 for a family holiday in May said the options don’t compensate for the inconvenience and losses due to the sudden announcement. For Rs 56,233, she had booked three return tickets in January for travel in May. “I spent a lot of time trying to contact the airline customer care to re-route. The options they gave us involved 10-20 hour transit in Kuala Lumpur, which is highly inconvenient. Now, we’ve decided to opt for a refund. We had luckily not booked a hotel,” she said and demanded that the airline book them on another flight to Bali or pay compensation for the losses incurred because of their decision to suspend flights. Since its launch in India, AirAsia has had an on-off relationship with Mumbai. 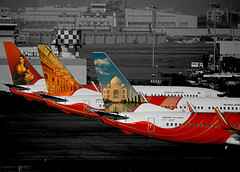 Air Asia had first launched flights into Mumbai in 2010 with daily departures to Kuala Lumpur. But the airline stopped the flights after two years, citing steep costs. AirAsia brands— AirAsia India, AirAsia Berhad, AirAsia X Berhad and Thai AirAsia—currently operate flights into 31 destinations in India, including all metros and several non-metros. Mumbai continues to blink and disappear on the AirAsia radar though.